La Ville Hotel & Suites will soon be getting in the Christmas spirit, with a range of seasonal activities and offerings starting from 20th November, culminating with what is sure to be a dazzling night to remember on 31st December. 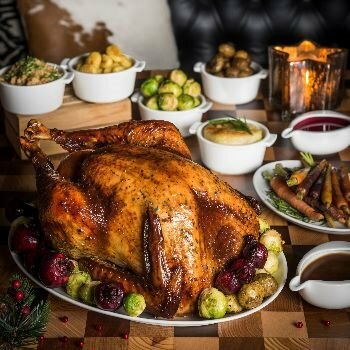 The recently introduced Friday brunches leading up to Christmas will be suitably merrily themed; traditional Turkey and German Goose will be served at Graze and Chival (also available for takeaway to enjoy at home); warmed festive beverages will be served at Grapeskin, and festive cheer will be suitably spread! For New Year’s Eve, with its far reaching views across Dubai’s skyline – including Burj Khalifa, LookUp will most certainly take centre stage. The rooftop bar will offer front row seats to one of the most anticipated firework shows in the city, and moreover, the world! Available 20th November – 28th December. Prior reservations recommended, placement of take-away orders 48 hours in advance required. Complimentary delivery to City Walk residents. Available 20th November – 28th December. Prior reservations recommended, placement of take-away orders 48 hours in advance required. Complimentary delivery to City Walk residents. To get into the spirit, a family-friendly Festive Brunch will be held on Friday 15th and Friday 22nd from 1pm – 4.30pm. Share the love this festive season with goodies from our Lobby Café at La Ville. What’s more, get into the spirit of Christmas with a complimentary season’s cookie when you order a hot beverage. Available 10th – 25th December. Festive dare: Wear your Christmas jumper and get a free Xmas mulled beverage! Advance payment required to secure booking. 4pm - 1am: À la carte offering with a minimum spend of 200 AED per person. On 31st December 2017, dine at GRAZE or Chival and receive a complimentary glass of bubbly. Lastly, to spread festive cheer, and as part of the Dubai Marriott ‘The More the Merrier’ campaign, from now until 17th January 2018 groups who dine at GRAZE and Chival will be in for a real treat! Dine with 5 persons at the hotel, and the 6th person eats for free! Dine with 10 persons and 2 dine for free, 15 persons and 3 dine for free, etc.